The Washington Post recently joined the choir of angry Western voices, arguing in favor of discontinuing all aid to Ukraine, until different kind of government comes into power, as one of the available options. Russian propaganda outletshappily latched on to this proposition. After all, the Kremlin has been promoting such a radical approach for quite some time. For example, RT tirelessly churned out a multitude of articles, aimed at dissuading both sides from continued Western aid to Ukraine. For the benefit of English-speaking audiences, RT hysterically exclaimed that American aid would support “Ukraine neo-Nazis.” On the other hand, RT put out pieces designed to convince Ukrainians that Western aid was only empowering their corrupt government and harming average citizens. In reality, Putin’s Russia is deeply corrupt and could care less about graft, corruption or rising utility prices in Ukraine. What they see is a twofold opportunity – promoting the “Ukraine fatigue” in the West, while on the other hand cultivating Ukrainian disillusionment with the perceived lack of support from the EU and the U.S. If this strategy succeeds, Ukraine will be pushed into the arms of Russia, as its only hope for survival. The Kremlin’s propaganda machine has been working towards this goal, promoting ludicrous ideas of “brotherhood” with the nation Russia so brutally attacked. Unsurprisingly, the West is being blamed for deliberately causing “the rift” between Ukraine and Russia. The true cause of the growing divide is Russia’s aggression and underhanded disinformation offensive unleashed against Ukraine. Ending up back in Putin’s suffocating sphere of influence would be the ultimate worst case scenario for the fledgling democracy in Ukraine and international security. 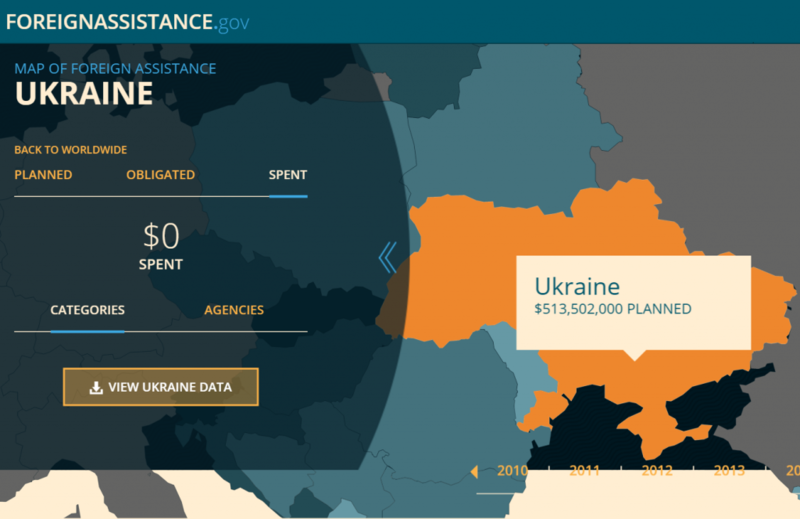 Stimulating civic activity, funding election watchdogs and non-state run reporting outlets in Ukraine. Promoting civic engagement, the rule of law, investigative journalism and election oversight. Strengthening democratic political culture and civil society by supporting the means through which citizens can freely organize, advocate, and communicate. Advancement and protection of individual rights for all citizens. Promoting economic growth by improving linkages to domestic and international markets. Increasing agricultural productivity and growth. Supporting comprehensive HIV/AIDS prevention, treatment, and care programs. Improving tuberculosis detection and treatment. Reducing maternal and child mortality rates. Expanding access to family planning and reproductive health programs. Improving water supply and sanitation. Special initiatives to fight corruption and the illegal cross-border trafficking of persons. Security assistance and intelligence support, including training, equipment, and logistics support, supplies and services, to military and other security forces of the Government of Ukraine, to enhance the capabilities of the military and other security forces to defend against further aggression, to develop the combat capability to defend its sovereignty and territorial integrity against actions of Russia and its proxies in Ukraine. Real time or near real time actionable intelligence, including by lease of such capabilities from United States commercial entities. Lethal assistance such as anti-armor weapon systems, mortars, crew-served weapons and ammunition, grenade launchers and ammunition, and small arms and ammunition. Counter-artillery radars, including medium-range and long-range counter-artillery radars that can detect and locate long-range artillery. Counter-electronic warfare capabilities such as secure communications equipment and other electronic protection systems. Training for critical combat operations such as planning, command and control, small unit tactics, counter-artillery tactics, logistics, countering improvised explosive devices, battle-field first aid, post-combat treatment, and medical evacuation. Indefinitely halting all of the above-mentioned aid and other planned assistance to Ukraine would do nothing to combat graft and corruption. On the other hand, establishing independent oversight, promoting independent journalism, supporting anti-corruption initiatives and reform-minded public officials would go a long way. Instead of throwing the baby out with the bathwater, the West should continue to support Ukraine in its plight towards democracy, political and economic independence from Russia, as well as its fight against corruption. The West should also take immediate action to fill the dire void in the media coverage of Ukraine – the virtual vacuum that is being eagerly filled with Kremlin propaganda, spread by the likes of RT. The lack of Western coverage suppresses any news of successful reforms and other positive developments. This creates the breeding ground for rabid anti-Ukrainian propaganda, conspiracy theories and outright fabrications by Russia’s English-speaking media octopus. While some of the Western opinion-makers appear to be vulnerable to Russian influence, democratic governments must remain steadfast in their support of Ukraine. The success of the Ukrainian nation would deal the biggest blow to Russia’s path of aggression, both militarily and in terms of the Kremlin’s virulent anti-Ukrainian propaganda. The outcome of the struggle between Ukraine’s fledgling democracy and Russia’s repressive autocracy will determine the path other nations might choose to pursue in the near future. Stable, successful and prosperous Ukraine is vitally important to the future stability of Europe and the world as a whole.